At Pleterje Charterhouse we cultivate 30 hectares of agricultural land. 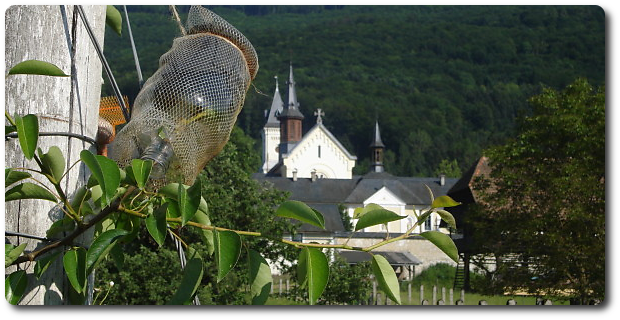 Within the monastery’s walls are fruit trees, vegetable garden and pastureland, while outside are vineyards, fields and meadows, and both we work in the most ecologically-friendly manner. 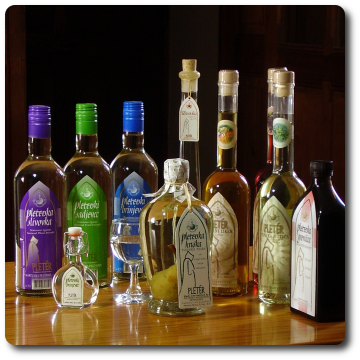 We produce fruit, grapes, apple and pear saplings, raise sheep, bees and fish, produce wine from grapes, fruit juice and brandy from fruits. As our vineyards and wine cellar are located in the middle of the Dolenjska region, our basic wine is cviček. This is a speciality of Slovenian wine as it is made from traditional kinds of red and white wines, with a low degree of alcohol and an agreeable acidity. Another tradition of Pleterje’s wine cellar is our mass wine, a dry or sweet wine created from chardonnay, pinot gris, kerner and welschriesling. 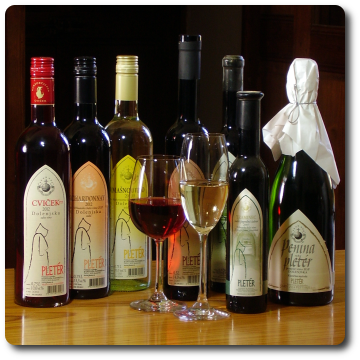 In good years we also make high-quality variety wines, predicate wines and sparkling wine. Pear, apple, plum and juniper berries create our natural brandies, which are aged in Pleterje’s cellar in wooden casks and then bottled in various sizes. Special among them is the Pleterje pear which grows inside the bottle before being topped off with pear brandy, and our bitters, made up of 49 different herbs in a fruit brandy. In the monastery garden there are many beehives. 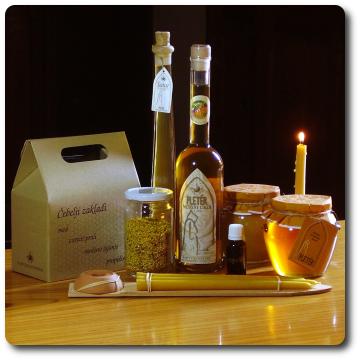 Besides floral and chestnut honey, we also produce pollen, propolis, a honey liqueur and beeswax candles.